Doughnuts. Is there anything they can't do? Probably not. The bread-baking adventure continues this month with something I have never attempted to make before - doughnuts. 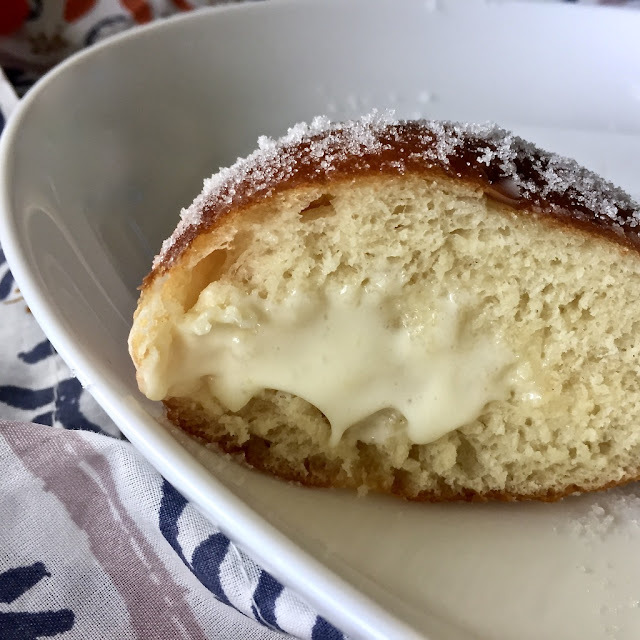 Sure, I've had my fair share of malasadas and doughnuts, but they have always store-bought - mostly because I thought they would be way beyond my experience level. Lucky for me the theme this month for Bread Bakers is Breakfast Breads, and doughnuts are the perfect little breakfast package. 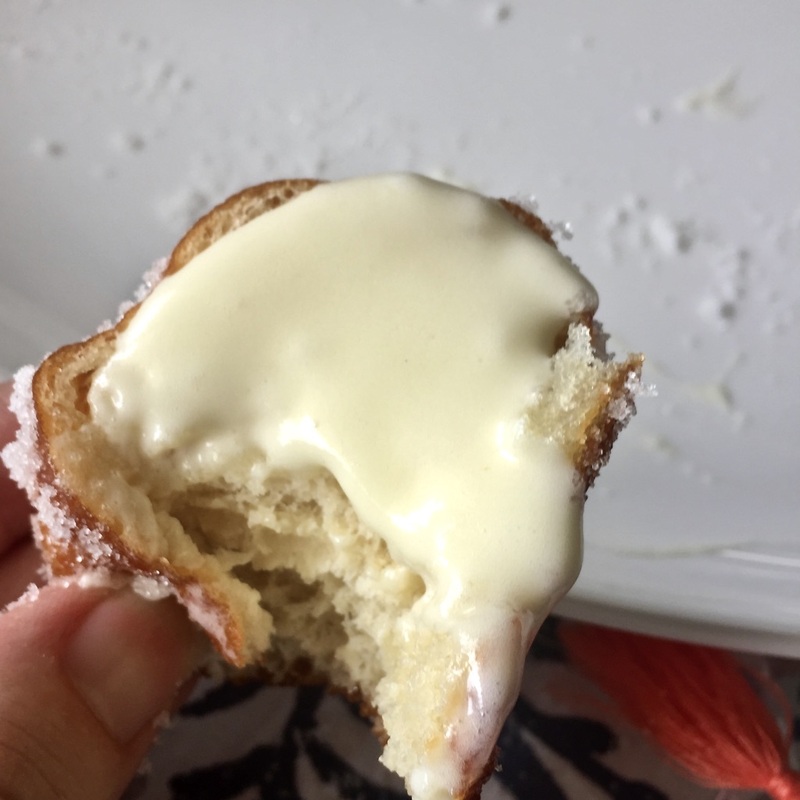 Especially these pączki with Lemon Cream Filling. 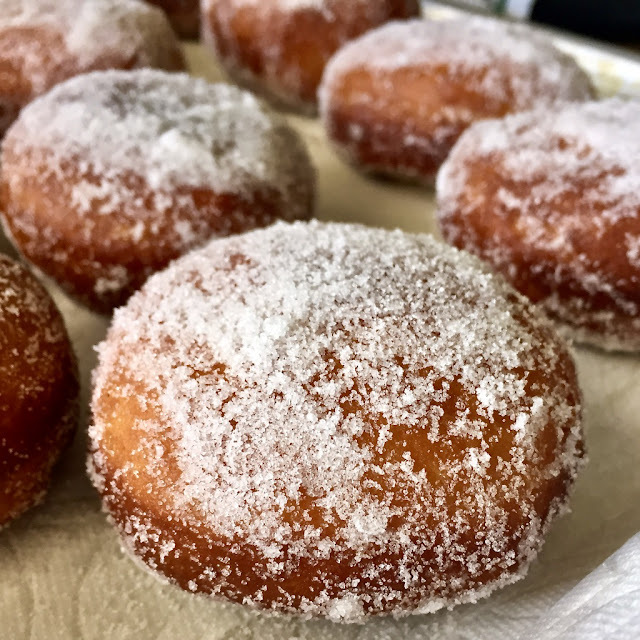 Pączki are Polish jelly or cream-filled doughnuts traditionally eaten just before lent as a way to use up all the available sugar, eggs, butter, and lard. Really, they are way too delicious to eat them only at that time. So, how is pączki pronounced? I'm not sure I even want to get into that debate. There are quite a few different variations, including poonch-kee, pownch-key, and paunch-key, so unless you are Polish, or have a Polish friend who can set you straight, pronounce at your own risk. Since I always seem to find making bread very therapeutic, I really didn't mind all the steps that went into making these pączki. 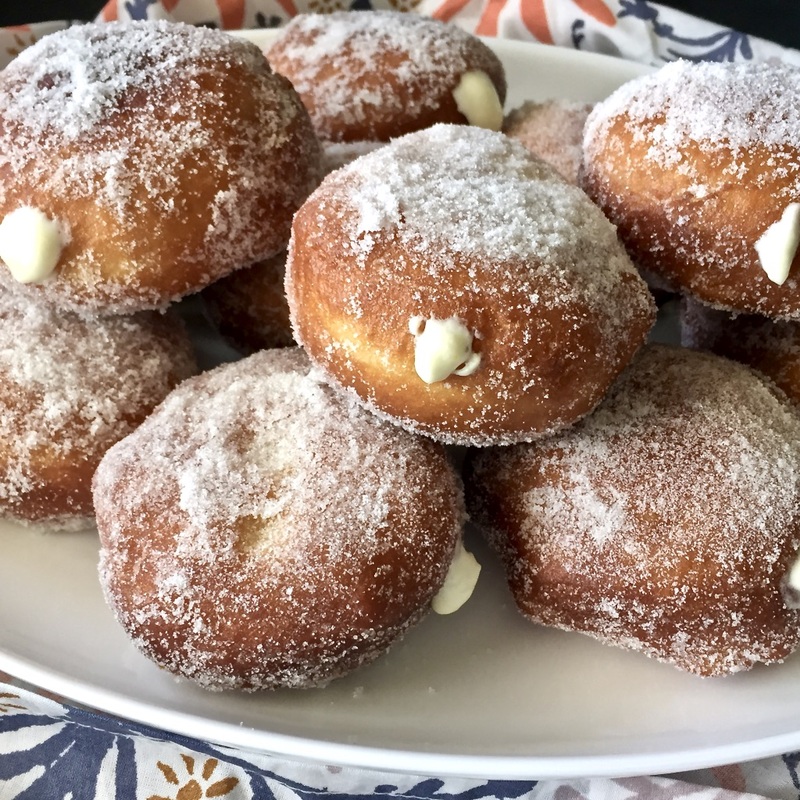 The reward of these soft, pillowy, little mounds of fried dough goodness was well worth the effort, and the lemon cream filling is the icing on top - or rather the filling in the middle. 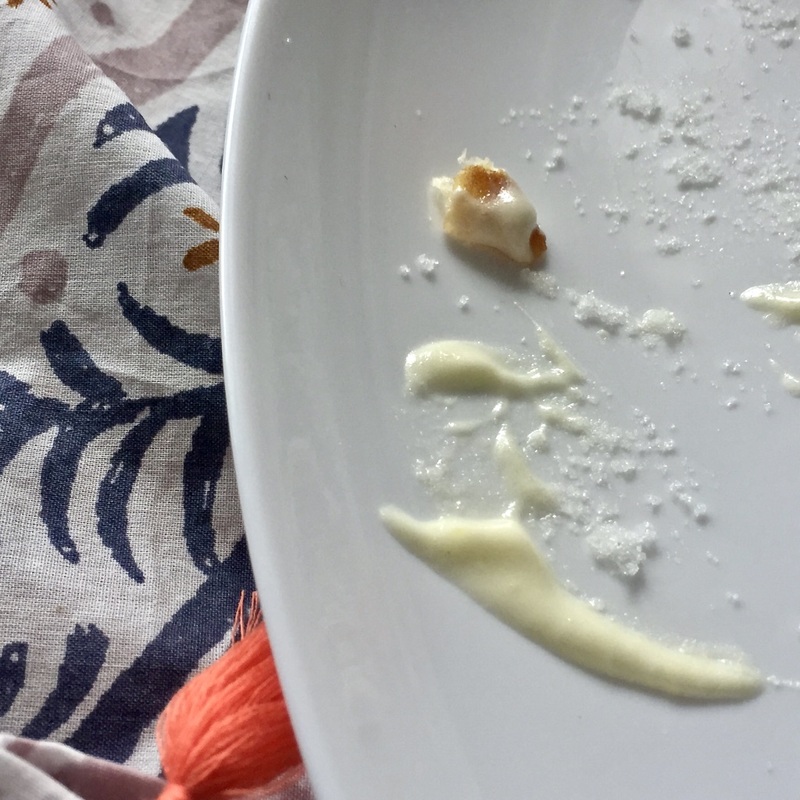 The lemon cream filling was so simple to make and I just wanted to eat it with a spoon. And I did. And then I put the rest inside the pączki. As you can see from the next photo I also added a little extra lemon cream to the ones I ate. The pączki are best eaten on the same day they are made, but can be stored in an airtight container at room temperature for up to 2 days. I popped them into the microwave for 30 seconds, and still thought they were yummy. 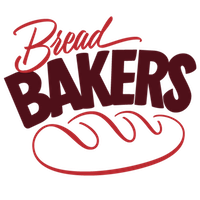 If you would like to know more about the Bread Bakers and see what the other bakers made for the Breakfast Breads theme please scroll down below the recipe. Pour warm milk into bowl of a stand mixer, stir in the yeast and a pinch of granulated sugar, and let stand for 5 to 10 minutes, or until it has become bubbly. Add 280g (2 cups) of flour to the mixture and stir with a wooden spoon until a smooth batter forms. Cover with plastic wrap and set in a warm spot for 30 minutes (the mixture should have risen and be very bubbly). In a medium bowl, whisk the egg and egg yolks until pale yellow and frothy, about 3 minutes. Add the sugar, vanilla extract and salt, and whisk until combined and smooth. Attach the dough hook to the mixer, add the egg mixture to the dough and mix on medium-low speed until mostly combined. Gradually add 420g (3 cups) of flour to the mixture and continue to knead until a very soft dough comes together. (It will not clean the sides of the bowl or form a ball; it will be rather slack and a bit sticky.) If necessary, add up to another 140g (1 cup) of flour, a spoonful at a time, until the dough forms. Transfer the dough to a lightly greased bowl, cover with plastic wrap, and set in a warm spot until it has doubled in size. Remove the dough from the bowl and turn out onto a floured work surface. With your fingers, push down the dough into an even layer. Sprinkle flour on the dough and roll it out to ½-inch thickness (if the dough doesn’t hold its shape and springs back, cover with a damp towel and let rest for a few minutes and try again). Use a 7.5cm (3-inch) biscuit cutter to cut out rounds of dough. Transfer the dough rounds to parchment-lined baking sheets. Gather scraps of dough and again roll out and cut until you have used up all of the dough. Cover the baking sheets loosely with plastic wrap and place in a warm, draft-free spot until almost doubled in size, about 30 minutes. While they are proofing make the lemon cream. Heat at least 4cm (1½-inches) of oil in a heavy-bottomed pot or deep skillet over medium heat to 180℃ (350 degrees℉). Carefully lower about six paczki into the oil at a time, being sure not to to over-crowd the pan, and fry until the bottom is golden brown. Carefully turn them over and continue to fry until the other side is golden brown. Use a spider strainer or slotted spoon to remove them to a paper towel-lined baking sheet to drain. Allow the oil to come back to temperature, then repeat until all of the paczki have been fried. Allow the paczki to cool until you are able to handle them easily. Using a filling tip, pipe lemon cream into the sides of the paczki, then roll in granulated sugar. Add the cream to a medium bowl and whip to very soft peaks. Add the lemon curd and continue to whip until well combined. I don't care how you say it, these paczki sound amazing! Hello Felice, Your recipe sounds so delicious. The filling is simply superb. This is bookmarked for sure. Thank You for being the host this month and for the lovely theme. Doughnuts are on my list Felice!!! Congratulations on such gorgeous results! I love baking bread for all of the same reasons. Beautiful photos! My husband (100% Polish) love paczki. I can't wait to surprise him with this homemade recipe. 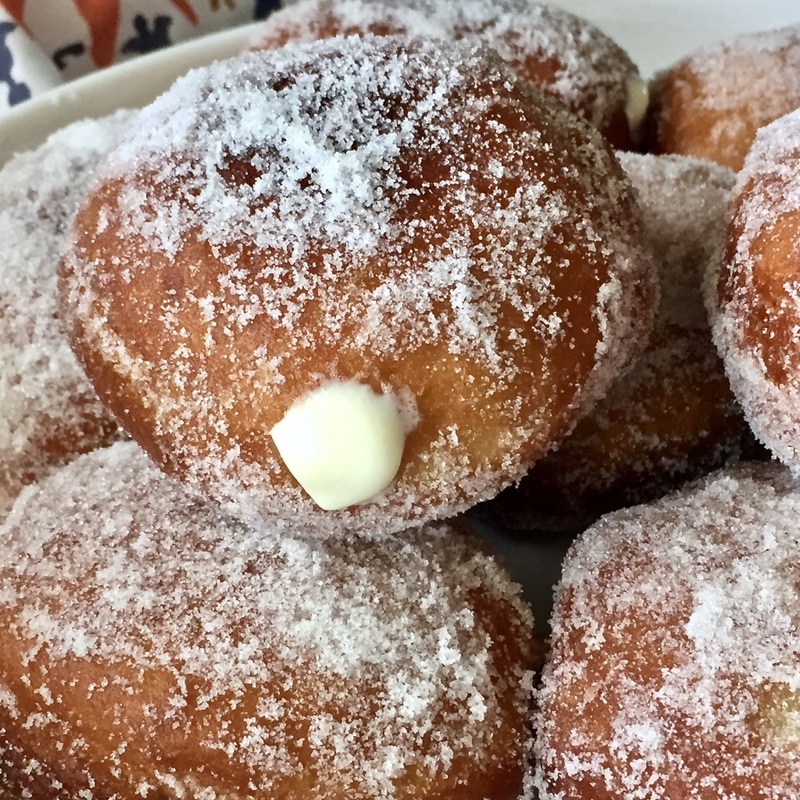 I'm so impressed that you made filled doughnuts, Felice! That's something that I've never tried either. They turned out brilliantly! Felice as soon as I clicked on your link, the doughnuts staring at me left me speechless... beautiful tempting and moth watering. 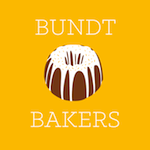 With a creamy and lemon curd filling simply yum. Oh my, I am literally drooling over these Paczki - they look absolutely amazing. That lemon curd filling sounds awesome.